STREAM Stage 2 requires 12 trial drug formulations to be available at the sites to implement the trial. Therefore, each STREAM trial site has at least one dedicated pharmacist and one pharmacy technician to manage the supply chain of trial drugs and ensure that each patient receives MDR-TB treatment daily. The trial drugs are sourced from the manufacturers, sent to the trial pharmacist at each site, repackaged into daily packs, and dispensed to the patients enrolled in the trial. Jan Komrska, a pharmacist at Vital Strategies, oversees the supply chain management of trial drugs for all STREAM sites. He also provides technical support and training for trial site pharmacists. 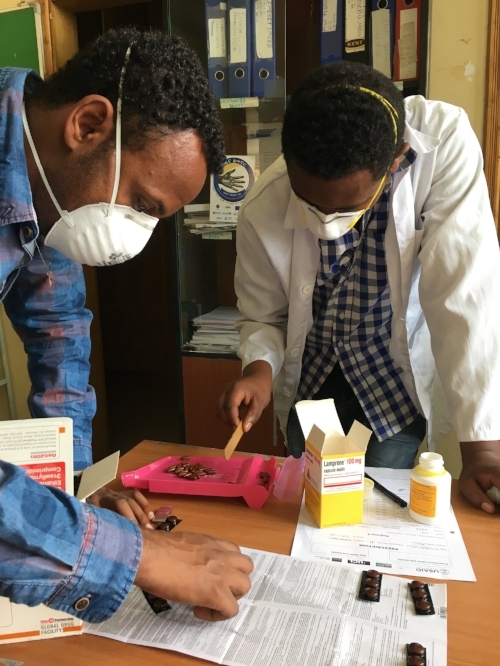 During his visit to Ethiopia in March 2017, he met site pharmacists Daniel Legese and Dereje Mirkano, who oversee the site at Armauer Hansen Research Institute (AHRI) in Addis Ababa. Daniel Legese joined the trial team in September 2016. His main tasks are to maintain an inventory of trial drugs received from the manufacturer and ensure that drugs are stored at a central facility under appropriate conditions as required by the manufacturer. He also oversees distribution to the two STREAM trial sites in Addis Ababa, AHRI and St. Peters Specialized Hospital. Daniel highlighted: “ My objective is to make study drugs available at the site in good condition and to make sure there are no stock outs that could lead to interruption of the patients’ therapy.” His work is critical to successfully treat patients with tuberculosis. Daniel also supports Dereje, and together, they ensure that medicines prescribed by the study physicians are received on time by patients.